I hope Spring has arrived in your neck of the woods. It can't make up its mind as to whether it wants to be in southwestern Ontario. ;) A couple of weekends ago we did have some beautiful Spring weather and I took the opportunity to go outside with some stencils and colour mist sprays to create some card backgrounds. I used Mister Huey's because that's what I had on hand but will link to various colour mists. 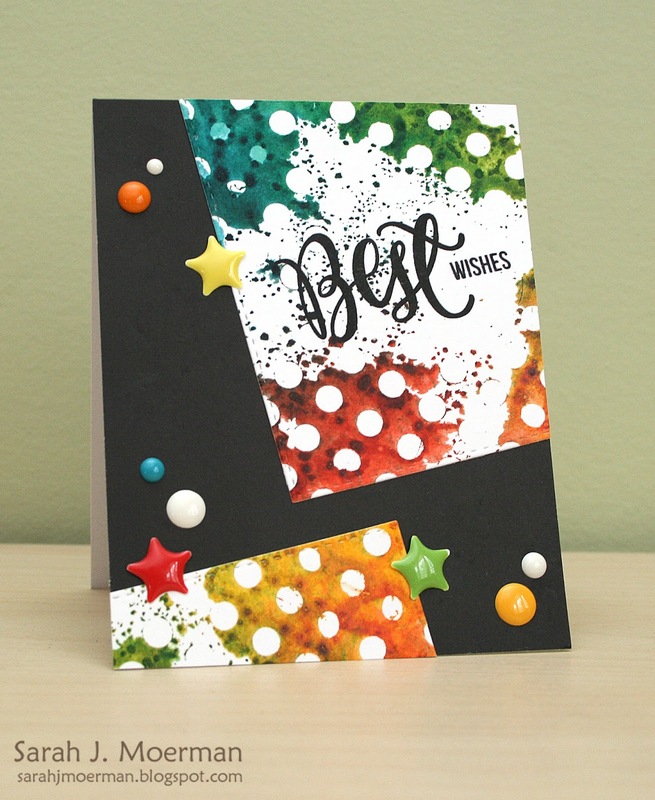 For today's card I sprayed the colour mists directly onto Simon's Medium Dots Stencil before pressing it onto some white cardstock. Once dry, I die cut the panel with the largest of Simon's Stitched Rectangles Dies, and stamped a sentiment from Simon's Best Hugs Stamps. I then cut the panel and pieced it onto my card front as shown before adding Various Enamel Dots. OMGoodness....I love this. I have some Lindys Stamp Gang sprays so I will be trying this technique, especially since it's SPRING here in Nebraska.....warm but lots of wind which then makes it cold. About every other day it's really springy. Keep sharing. I love what you do.